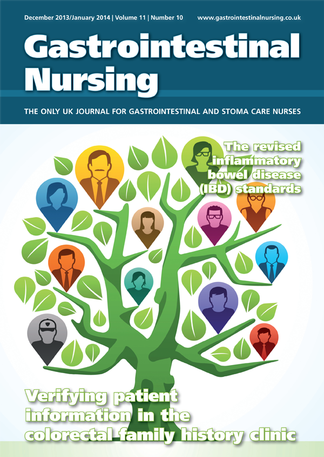 Gastrointestinal Nursing is the UK’s leading journal exclusively dedicated to all gastrointestinal and stoma care nurses. It is a vital resource for anyone working in this fast-developing area of nursing who wants to further their career, develop their training and enhance their knowledge and skills in all areas of practice. Each issue of Gastrointestinal Nursing is packed with peer-reviewed clinical, professional and educational articles covering all aspects of upper and lower gastrointestinal nursing practice. The journal features all the specialties in the field, including stoma care, endoscopy, IBD, nutrition, coloproctology and hepatobiliary nursing. Be the first person to tell us what you think about Gastrointestinal Nursing and you'll save £2.50 on your next purchase!